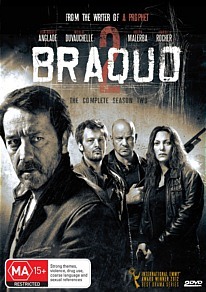 Braquo Season 2 DVD Review This is European crime-drama at its best! Season 2 of the award winning French police crime-drama returns as the viewer is joined with Caplam, Morlighem, Roxanne and Vachewski as their repercussions from season one continues. As Caplan is awaiting trial, Morlighem and Roxanne have been demoted and Vachewski is forced to leave the police force. With all this happening, you really need to watch the first season of Braquo as season 2 can be quite messy at times, especially with the subtitles. Season one saw all four of these characters break the rules and to compound the situation, someone else has been pulling their strings like some masterful puppeteer. Although Caplan is waiting trial, he manages the unthinkable and brings his crew back together again if they can infiltrate a dangerous terrorist organisation. If they succeed, they are cleared of all charges and they can recommence their lives before their downfall... if they fail, they will end up dead. Needless to say, once the team is reunited, the bloodshed ensues and some of the scenes can be quite distressing. Given that, this series does not pull any punches and shows the grittiness of life. What makes it so more engaging is seeing it from a European point of view and without the glorified touch of Hollywood. The result... a very gripping crime-drama. Apart from the overtly violent stories in Braquo, the other strongpoint are the characters themselves. Writer Abdel Raouf Dafri should be commended with the realistic dialogue as you can really get into their headspace and more importantly, you don't know who the real villains are which keeps you guessing throughout the episodes. This is European crime-drama at its best!